My apartment is in a beautiful location, near Nakajima Koen (literally "center island park") and across from a shrine. The Kamokamo Kawa (literally, "duck duck river") runs through both of them, and one can see ducks swimming there all year round. 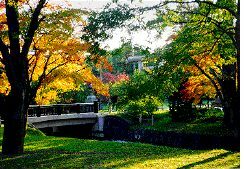 The photo above is of a bridge to the shrine. 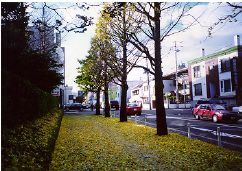 In late October and early November, the gingko trees across the street from my apartment turn gold. 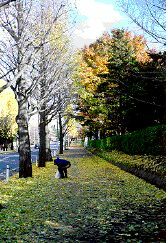 On the left is a view of the fallen leaves taken in mid-November. You can also see my apartment (the building with the red car parked in front of it) before construction around it began in November, 1999. Huge numbers of people come to pick up the fallen ginkgo nuts, probably to use in soup. I've never tried them myself because the skin has a really bad odor. However, they are said to have some interesting medicinal effects. Last updated August 16, 2000.